Trying to get your cat to do something it doesn’t want to is a bit like, well, herding cats. In simple terms: impossible. 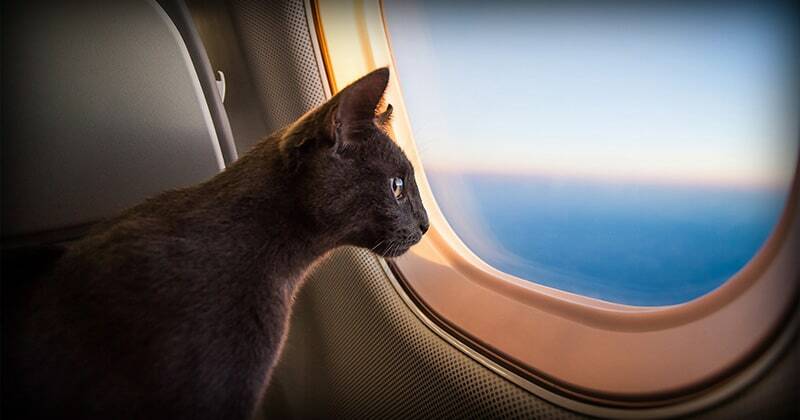 Like many humans (this writer included), some cats are very nervous flyers. Cats generally react badly to unfamiliar places, smells and sensations. Therefore, taking your cat onto an airplane can, therefore, be very difficult. As well as trying to make your pet as comfortable as possible, you have to consider other passengers, who may not be keen on having a loud, thrashing furball sitting next to them. Unfortunately, as much as they might hate it, sometimes it is necessary to travel with your cat. You might be moving abroad, taking an extended vacation or visiting family and friends. To keep your cat comfortable, safe and secure, it is worth investing in a high-quality cat carrier. With any luck, your cat will drift off into some lovely, kitty dreams and the journey will be over before they know it. The choice is huge, with different shapes, sizes and designs depending on your pet’s needs and the intended use. If you’re taking your cat on a plane, you’ll need to purchase a carrier which is airline approved. 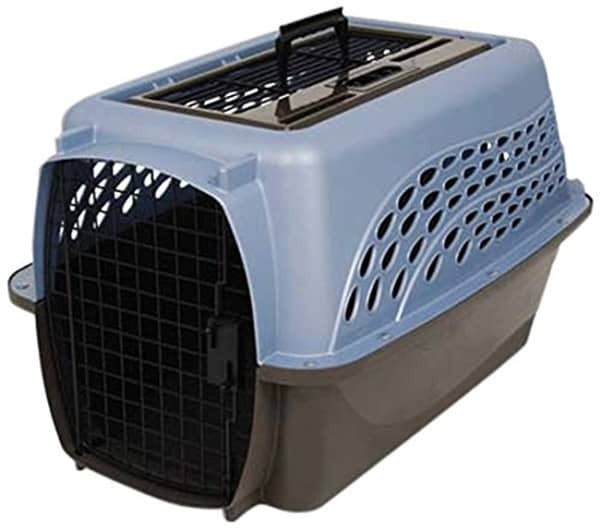 The carrier has to be large enough for your pet to stand, turn around and lie down comfortably. If your pet is travelling in the hold of the plane, the carrier must be made of fiberglass, metal or rigid plastic and the floor must be solid and leak proof. Hard shell carriers provide sturdy protection for your pet are better at withstanding any knocks, plus they are more likely to contain any liquids if your pet has an accident. Soft carriers are generally acceptable if your pet is travelling in the cabin, plus they have the added advantage of being collapsible so they’re much easier to store. Carriers which are going in the cargo of the plane must have a secure, spring loaded, all round locking system with the pins extending at least 1.6cm above and below the door. Doors must be constructed of heavy plastic, welded or cast metal strong enough so that a pet cannot bend them. The hold carriers must have ventilation on at least two sides and some international carriers require 4 sides. The openings must be a minimum of 1 inch (2.5 cm) over the upper two thirds of the opposite end and the remaining two sides, at a distance of 4 inches (10 cm) from center to center of each opening. The total ventilated area must be at least 16% of the total surface of the four sides. We’ve put together a list of the best cat carriers for both in cabin and hold travel so that your pet is comfortable during its adventure. All of the carriers featured are approved by the TSA, but you should check the specific restrictions of your airline before travelling. This clever carrier expands from two sides, allowing your pet to move around. Unzipping the sides creates a comfortable area so that your pet is able to move around with increased air ventilation. The extra space prevents your cat feeling as trapped and will hopefully reduce their stress during the flight. A wire frame prevents the expandable sections from sagging or bunching up at the edges. The frame has the added bonus of creating an extra layer of protection for your pet against any knocks. As well as a free pet bowl, the Pet Peppy carrier comes with a shoulder strap and fleece base inside. You can store your pet’s snacks, treats and medicine in the side slip pocket. The carrier’s foldable design allows you to zip the whole thing flat into a compact size for storage. The SLEEKO Pet Carrier is FAA approved and bits under the airplane seats of most major airlines. Its mesh ventilation on the top and the sides allows for improved air circulation inside the carrier for your cat. It also has two removable, ultra-soft fleece pads which help your cat feel comfortable inside. You could remove these from the carrier and place them in your cat’s bed for a few weeks prior to the journey so that they smell of your cat, therefore making them less wary of the carrier itself. It’s super durable, made with tear-resistant mesh and polyester fabric. The sturdy inserts along its bottom and sides prevent the carrier from sagging. It comes with a clip-on shoulder strap and padded hand strap to make it easy for you to carry and hold the carrier. The carrier is also suitable for use in a car as it has two seat buckles, safety buckle zippers and even reflective strips for night visibility. 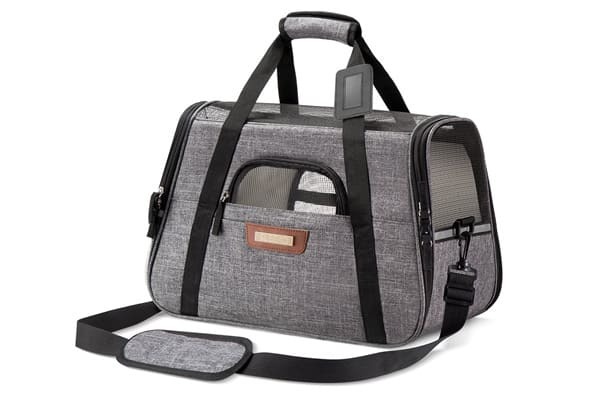 A great carrier if your pet is travelling in the cargo-section. This hard-shell carrier will keep your cat safe and complies with most airline requirements (although you should always check your specific airline before travelling). The Sky Kennel is made from heavy-duty, high-strength plastic. It comes in six different sizes, so that you can choose the correct size based on your cat’s measurements. Remember, your cat will need enough space to stand up, turn around and lie down comfortably during the flight. 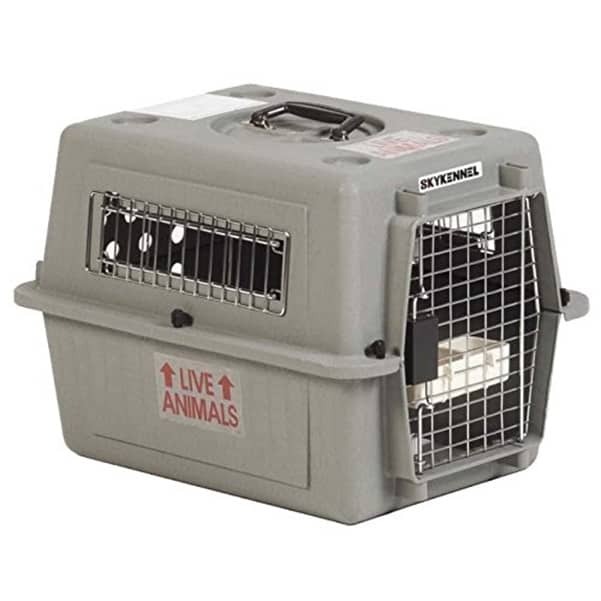 The carrier features a sturdy metal wire door which interlocks for extra security. The wire ventilation windows allow a healthy air flow throughout the carrier. Each kennel includes ‘Live Animal’ labels, identification stickers, an absorbent pad and food and water cups. As a bonus, the Sky Kennel is also eco-friendly as it is made of 25% recycled materials. 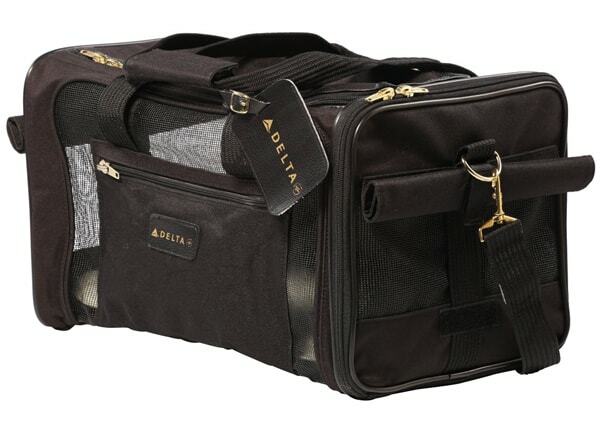 As the official pet carrier of Delta Airlines, you can be sure that your pet is in for a safe and comfortable ride with the Sherpa Deluxe Carrier. The carrier fits securely under the seat in front of you, as the patented spring wire frame allows the rear end of the carrier to be pushed down several inches to conform to under seat requirements. Ventilation is created through mesh panels along the sides, which also have roll down privacy flaps if your pet starts feeling anxious. Top and side openings give you multiple options for loading your cat into the carrier, whilst the locking zippers prevent your cat from escaping. As well as luggage tags, the carrier comes with a no-slip shoulder strap, a seat belt security strap which doubles as a luggage strap and a soft, removable faux lambskin liner. The liner is machine washable and Sherpa replacement liners are also available for purchase. Suitable for cargo travel, this steel and plastic constructed carrier guarantees a safe journey for your cat. The two-door design gives you options when loading your cat and its wire mesh door locks securely with a wing-nut and bolt design. 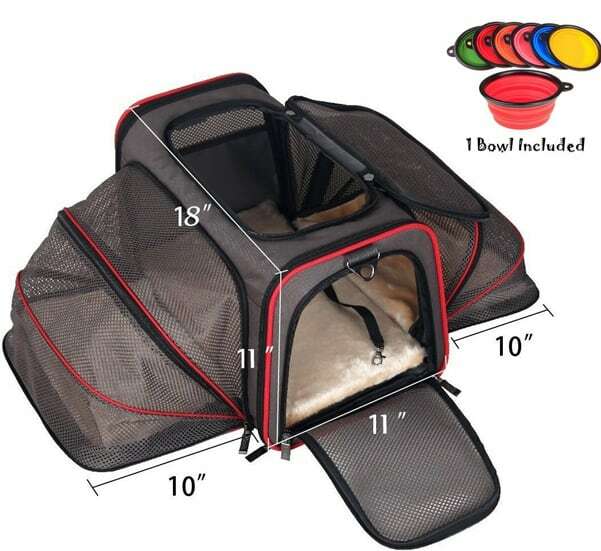 As well as the door, there are ventilation grates along the top and side of the carrier, which ensures your cat will have plenty of air circulation inside. As well as choosing a safe and secure carrier, try to anticipate your cat’s needs whilst travelling. They will certainly need food and water bowls, and may also enjoy having a toy to play with to prevent boredom. Dry food is probably less likely to irritate other passengers with its smell, so consider switching your cat to this in anticipation of your journey. With all this consideration, your cat is sure to have a relaxing journey.